This is a non-commercial page. No evidence of copyright was found for these issues. 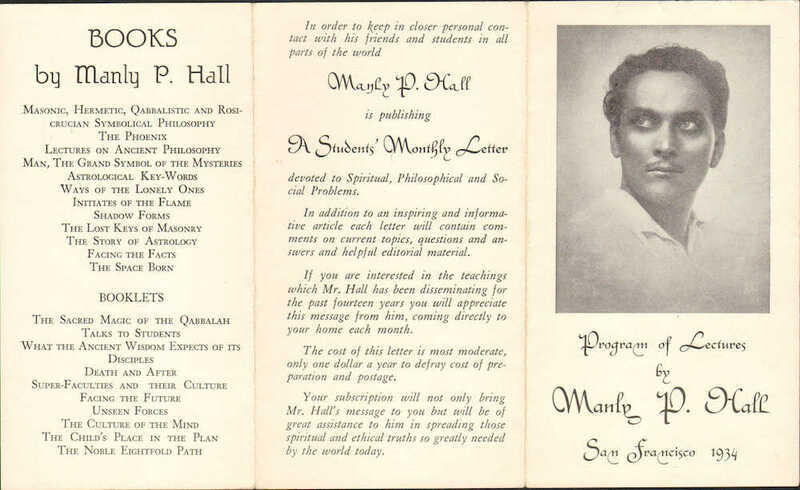 How can a student of the ancient wisdom teachings contact bona fide sources of occult philosophy and spiritual instruction? What is the safest course for students of higher knowledge to pursue at this time in their quest for wisdom? Is theology the same as religion? We have a three-year-old daughter. What religious training do you recommend? Is it possible to reconcile the idea of a personal God with the impersonal God? Can science be reconciled with religion? Can past Karma be escaped by present good deeds? Would you advise a man to leave civilization who cannot make spiritual progress among a corrupt and evil populace? How can a drone become useful at fifty? Now that I understand things better I want to be useful. Is it possible to separate spirituality and wisdom? In other words, can a person be spiritually perfect and yet not possess all knowledge? Do people appreciate only what they pay well for? Please explain the money principle in connection with spiritual instruction. What advice do you give to a person who desires to apply himself to a serious study of the Ancient Wisdom Teachings? Do disembodied spirits retain a memory of their earth-life experiences? Can the average individual control to any extent the length of time between incarnations or determine in advance what his next incarnation shall be? If we do not develop spiritually in this life sufficiently to remember our past lives, do we automatically come into possession of this remembrance when we reach the astral world after death? Do parents give their children only physical bodies? Please differentiate between body, mind, soul and spirit. Is a balance between introversion and extroversion better than introversion even though the latter is associated with serious thought but no social contact? Will the finality of life ever be known? If we are to do good, does it matter if we hurt people's feelings doing it? In what way does Rosicrucianism differ from other Wisdom Religions and when did it have its beginning? There are many different schools of mysticism and occultism in the world. How can a student discover with certainty the system best suited to his individual needs? Please give your version of the idea of a person being divinely protected. We so often hear someone say that they have no fear of anything because they are divinely protected. Does not the law of cause and effect render this idea untenable? Please give the names of the best works to read on the interpretation of the Grecian myths. Has the sixth root race started to appear upon the earth? Please give a practical definition of mysticism. The expectation of the coming World Teacher seems to be wide spread, being as common in Asia for example as in this country. Is there a justification for this expectation? What part does nationality play in Reincarnation? Does a person incarnate into a different nation each time he is reborn? Please tell us what sorcery really is? Are there any other records of Jesus than the four Gospels? What is the best way to overcome an obsession? What place have insects in the scheme of evolution? Are they a legitimate life stream? Why is it that child prodigies in the majority of cases are "burned out" by the time they mature? Why do they not go on developing? Please give your interpretation of the Holy Ghost. Can peace in the outer life be attained without attaining peace within? Do you recommend fasting as a means of advancing spiritually? Does it harm one to attend spiritualistic meetings? What is the proper philosophical attitude towards politics? Should Occult Students take an active part in political reforms and social programs? What should be the attitude of the Occult Student towards Surgery? Is not a physical demonstration of prosperity an evidence that the person has accomplished an inner illuminaton and is able to control the law of Supply and Demand? In what way does an Initiate or Adept differ from an ordinary person? Please tell us something about the antiquity of the Rosicrucian Order. Many metaphysicians claim to have experienced extraordinary psychical phenomena. They describe visions of an amazing nature, asserting that they are able to see and converse with ghosts, spirits, elementals, superhuman creatures, invisible adepts and divinities, and even the persons of the Godhead Itself. Many metaphysical organizations make similar claims, affirming their material movements to be directed by superhuman entities. Please clarify this matter. What is the proper philosophical attitude towards suicide? Does the doctrine of Reincarnation conflict with the teachings of Christianity? To what degree is a university education useful to a person interested in the perfecting of his inner spiritual life? Have we entered the Aquarian Age yet? Some time ago I went to an Evangelistic meeting and during the service there were people who took the baptism of the Holy Spirit. They became hysterical and rolled on the floor for over an hour. They were supposed to be under the power of God. I would like to know your opinion regarding this? Please tell me what books will assist me in the study of the Sacred Magic of the Kabbalah, numbers, etc., and where I can obtain them? If it is the purpose of the Occult Sciences to perfect the individual in the philosophic virtues, why are so many people interested in Metaphysical Subjects so lacking in the rudiments of discrimination and poise? Please explain the Mystery of Omens. Please have something to say on the subject of Diet. Is there any virtue in sleeping with the head to the north, south, east or west? Is is true that men should live much longer than most do at the present time? 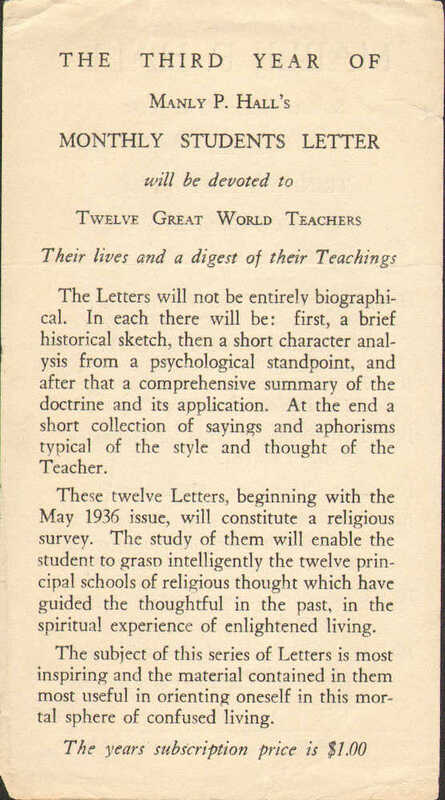 Some metaphysical Teachers promise that through the study of their philosophies students can evade the effects of certain natural laws such as Reincarnation and Karma; other metaphysical Teachers promise miracles of health and prosperity to their followers; and still others assure their disciples spiritual and material protection against the evils of life. Please clarify the relationship between codes of spiritual action and the material rewards arising from such action.